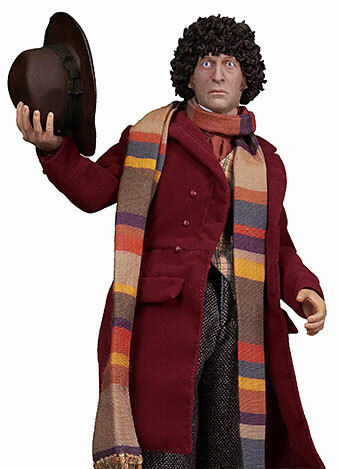 As part of their series of 50th anniversary figures, Big Chief have announced a signed 1:6th scale figure of Tom Baker's fourth Doctor, signed by the man himself. Just in time for the 50th Anniversary the fan favourite Time Lord will come complete with his trademark scarf and hat, plus his trusty Sonic and a selection of related accessories. The figure will also come with a display base featuring an illuminating light-up function, revealing the Gallifreyan symbol for four. The ultra-limited Signature Edition will come with an autograph plaque, hand-signed by Tom Baker, together with a plaque stand and certificate of authenticity. Big Chief have previously released high-end 1:6th scale figures of the tenth and eleventh Doctors, but this is the first time they have produced one from the classic series. The Signature Edition will be limited to a run of 300 pieces and there will also be a Limited Edition version. Both with be available to pre-order soon. More information about Big Chief as well as this and other figure releases can be found on their website.